This loco is a green 0-4-0DM with a 107 hp Gardner 6LW engine and weighs 14 Tons. She was one of 13 of these small shunting locos, 5 of which were exported to India and New Zealand as 5ft 6in and 3ft 6in gauge and one to Egypt. She was ex-works from Robert Stephenson & Hawthorns Newcastle works in 1958, with works number 7901, to English Electric Co Ltd, Netherton Works, Liverpool. About 6/1958 she was sold to British Industrial Sand Ltd, Holmethorpe sand pits, Redhill, Surrey and moved to Marley Hill in 6/1987. She is normally used for shunting and permanent way trains. 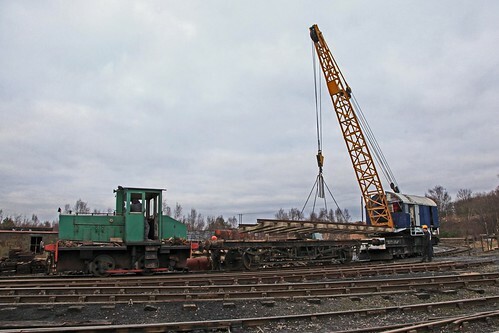 Sister loco RSHN 7900/58 is preserved at AV Dawson Ltd, Middlesbrough, Teesside. Photo: HUSKY at Marley Hill, on a permanent way train, the crane can be seen at the other end, By E.Garrod.